This information is provided to assist the relevant authorities when assessing the Navitus Bay Wind Park development. I have completed a number of infrasound measurements in Australia, the UK and Ireland that were designed to assess the acoustic imissions in the surrounding communities. 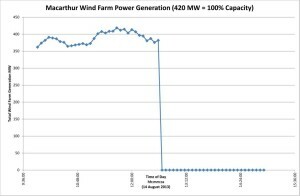 I was lucky to have deployed my infrasound recording equipment inside a home 1.6km upwind from the Macarthur wind farm in Victoria, Australia when there was a full unintended shutdown due to a substation failure when the wind farm was operating at almost full capacity. The subsequent start-up was also observed approximately 12 hours later, again at an upwind measurement location. This wind farm had approximately 140 Vestas V112 3MW turbines operating. The following spectrograms show the dominant tone components in the infrasound region before and after shutdown (figure 1) and prior to and after start-up (figure 2). The vertical frequency scale for figures 1 and 2 is linear from 0Hz to 8Hz. 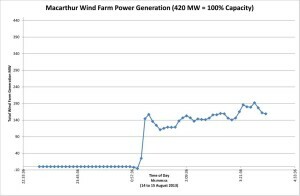 Figures 3 and 4 show the Macarthur wind farm power generation during the shutdown and start-up respectively. The average sound pressure level between 0.45 Hz and 6 Hz shows a 3.5 dB reduction when the turbines stopped rotating from a 95% load capacity condition. A sound level increase of 1.5 dB was observed before to after start-up to a load condition of approximately 30% power generation capacity. The tone „lines‟ in the spectrograms show that structural resonances from the turbines continue irrespective of whether the blades are rotating or parked. The differences between rotors parked or rotating shows as an increase in broadband sound which is responsible for the change in overall sound pressure level from 0.45 Hz to 6 Hz. Structural resonances responsible for the infrasound emissions observed are evident over a wide range of wind speeds. Superimposed upon the geometric attenuation are other factors such as air attenuation and differing amounts of ground absorption. Over water, the „ground‟ (water/air interface) absorption is negligible. Infrasound does not follow the hemispherical divergence model of 6 dB reduction in pressure for a doubling of distance (in the far field). There has been a large volume of research work completed in the mid 1980‟s by researchers at NASA. Research work on the MOD-1 wind turbine (that was recognised to produce adverse health effects in the community) suggest a geometrical spreading of 3 dB per doubling of distance for infrasonic sound frequencies. I have completed similar propagation attenuation measurements for two turbines at the Leonards Hill wind farm in Victoria, Australia and have also found an attenuation rate of approximately 3 dB per doubling of distance out to 34 km from the two Repower 2MW wind turbines. My measurements of infrasound attenuation rates with distance in the near field of the Macarthur wind farm from 1.6km to 5.4km have shown no attenuation with distance. The wind farm dimensions are approximately 5km wide near the residences mentioned. I completed a set of measurements at a residence located 5km inland from Clacton-on-Sea in April 2014. The residence is located in a direct line through Clacton to the London Array that is some 25km away from Clacton. The residence is also approximately 900m from the nearest turbine in the Earls Hall Wind Farm. 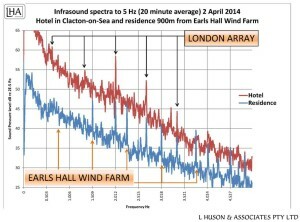 Measurements taken in Clacton allowed identification of the dominant infrasound tones from the London Array to be identified. Figure 5 shows an example of a single 20-minute infrasound recording taken at the residence near to the Earls Hall Wind Farm. A chart showing the tones associated with the London Array from a measurement in Clacton is also shown for reference. The key finding is that infrasound tones observed 30km from the London Array and 5km inland are found to be at levels observed from five 2MW turbines located a minimum of 900m away. This finding has relevance to the proposed Navitus Bay Wind Park. The proposed size of wind turbine for Navitus Bay is significantly larger than the turbines of the London Array and one would expect higher infrasound emissions. Large residential communities border the coastlines of the Isle of Wight and Dorset within 35km of the Navitus Bay Wind Park perimeter. If these populations are exposed to the equivalent infrasound dose one experiences 900m from a 5 turbine wind farm (2MW turbines) then it may be that large scale adverse effects can occur. I have reviewed the Environmental Statement for the Navitus Bay project and cannot find any assessment of infrasound or low frequency sound. I believe that the development application is deficient in this regard. Notwithstanding that a large volume of NASA research in the 1980‟s already demonstrates potential health effects due to infrasound from wind turbines, in Australia, it has been acknowledged that more research into the health effects of infrasound from wind turbines is needed (Senate Inquiry on wind farms in the community, 2011, and the latest statement from the Australian NHMRC). Such work has yet to be commissioned. I have experience modelling underwater noise and the effects upon wildlife. I have assessed blast noise impacts on Dugong for the Australian Department of Defence in 2000 and more recently in the prediction of sound exposure level pressures in shallow water from blasting in 2009. I am familiar with the assessment methodologies used in the underwater impact assessment and would simply like to make the following comments. The impact assessment is heavily biased towards assessing the impacts from piling during construction. The impact assessment clearly shows that avoidance of the areas between the development and coast is likely and that avoidance (as classified in the USA) is „harm‟. Given that the proposed Navitus Bay development is substantially larger than the single 1MW turbine cited above it would be expected that more relevant recent data could be found to assess the impact of the proposed wind park. I believe that it would be appropriate to commission a survey in and around the London Array, for example, to get an understanding of the sound pressures involved from a similar scale development. I have failed to find any reference to offshore wind farms in my copy of Marine Mammals and Noise, Richardson et al, 1995 that is referenced in Volume B Chapter 11. Although reference is made to this book regarding wind farm generated underwater noise, more recent references on the subject should have been provided. It would be expected that the structural resonances observed via infrasound emission from the London Array (detailed above) would also be observed underwater. The extent of which is worthy of investigation prior to accepting the underwater impact assessment. Posted on: 7 July 2014 . Category: Acoustics. Tags: Earls Hall Wind Farm, Infrasound, Leonards Hill Wind Farm, Macarthur, Navitus Bay Wind Park, Sound Propagation, The London Array, Underwater Acoustics, Underwater Impact Assessment, Vestas, Victoria, W. Les Huson.